Lottie struggles to learn how to use her gift of healing so she can save her best friend Eliot. She must hurry, because the longer Eliot stays in the land of Limn, the sicker he’ll become. When her hosts in the South make a bargain with the elusive Rebel Gem of the Northerly Kingdom, Lottie and her friends must travel north instead of returning Eliot home. A treacherous king’s servant, a powerful shape-shifter named Iolanthe pursues them, sending assassins after Lottie. To protect her, Lottie’s companions must make a dangerous journey to find the one weapon that will stop the evil king. My favorite thing about The Doorway and the Deep was the fun cast of characters. Each one is very different, and each enjoyable. I loved Oliver’s poetry and Fife’s mischievous antics and the brief unexpected romance that blossomed between a couple characters. Lottie is clever and complex, definitely the kind of heroine I enjoy reading about. I had a little trouble following some of the elements of the tale more deeply embedded in the storyworld—probably because I haven’t read the first book, in which all that setup was explained. It didn’t prevent me from enjoying the story, but I think I’d have gotten more out of it had I read the first book before this one. 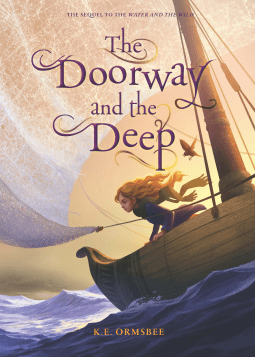 The Doorway and the Deep ends with a pretty powerful hook. I definitely didn’t see that coming. I feel like that can be a big risk because it can feel a little gimmicky sometimes. This was okay. I liked the characters enough that I’d be interested in continuing the series. Most of the characters are wisps or fairies. I don’t think there were racial descriptions. Most of the characters feel a little bit British to me, but I’m not 100% sure why. A couple of brief m/f kisses. Lottie and her friends train to better use their magical abilities. Each has one specific ability, for instance, Lottie’s ability to heal. Fife can float. Adelaide can hear over long distances. Oliver’s gift causes physical harm. A powerful shape-shifter sends assassins after Lottie. Brief battles injure more than one character. Tagged Chronicle Books, Fairies, K. E. Ormsbee, The Doorway and the Deep, The Water and the Wild, Wisps. Bookmark the permalink.